This was a gainful week of translating ideas into action and more action still to help Hands Up For Kids take off from the runway into the limitless sky. It was thoroughly fun and exciting working with Monika because she's an inexhaustible action lady but at the same time always well grounded and centred. 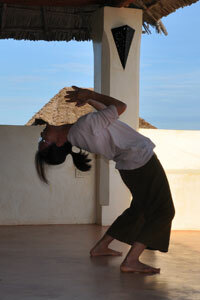 She attributes her clarity and steadiness to her daily morning routine of pranayama-kriya-meditation. 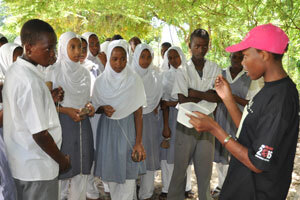 Today, we went to Lamu Town to conduct a training session for some youth from the Lamu Youth Alliance. 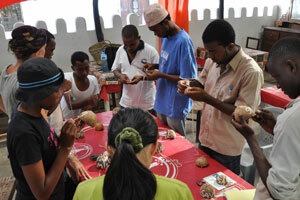 Mercy, our first youth leader, conducted the coconut art workshop hands-on training and every youth made at least one coconut necklace. 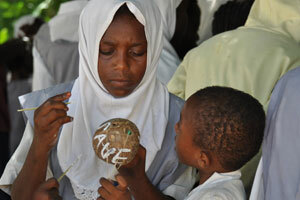 The idea was to duplicate more youth leaders to conduct this simple workshop in different schools across Lamu. 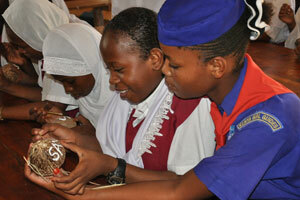 We hope that these youth would take this opportunity to actively contribute towards this community project. 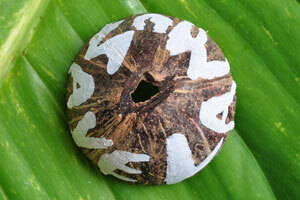 Tirelessly we talked to anyone who would listen to our donkey coconut necklace idea. 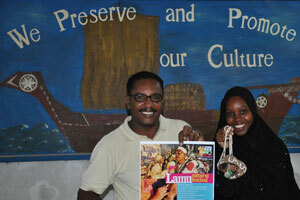 We also got support from the Lamu Cultural Festival organizer who offered us a performance slot and stand. 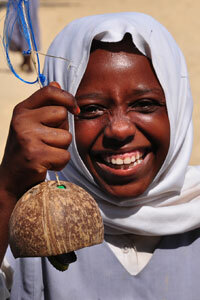 Mercy gathering kids in Shela to make more coconut necklaces. 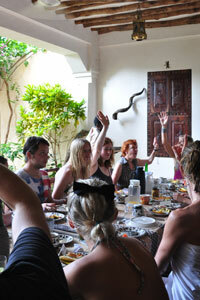 Each morning, we went to a different spot for kriya. Our fav spot was the roof at the wellness centre. Robyn specializes in kriya-in-bed while Monika always does hers at the wellness hall. Robyn helping Patricia to launch a new HandsUp4Kids Facebook Page. by his 'best friend' Alvin. 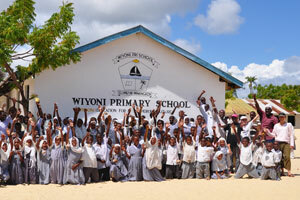 We set off in a boat to Wiyoni Primary School. 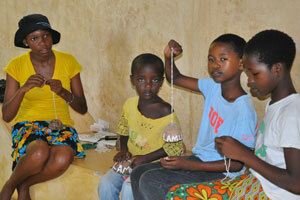 Mercy joined us to be the youth trainer for the art workshop. The headmasters of both Wiyoni and Mkomani were very supportive of our idea so we hope to make these 2 schools the models for the rest to follow. 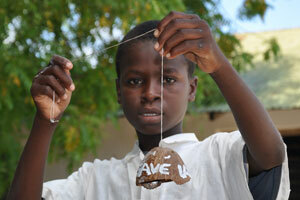 Productivity wise, we hope to have a few hundred necklaces made and painted by end of the day. 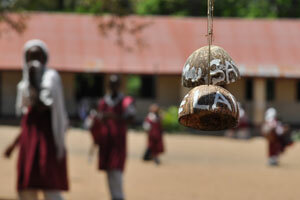 The kids ran out and greeted us warmly with their handmade coconut necklaces! "Let me make a hole..."
The headmaster and teachers were all actively involved and dispatched class by class to our painting station under the tree class by class. 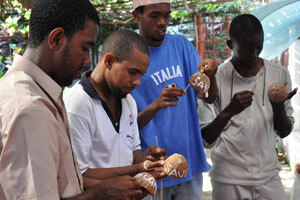 All the kids had so much fun putting the final touches on their coconut craftwork. 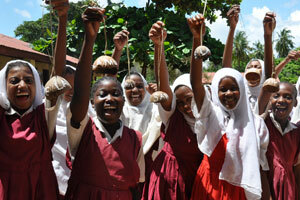 We were mighty glad to have kicked off the coconut art workshop in school with a high at Wiyoni. 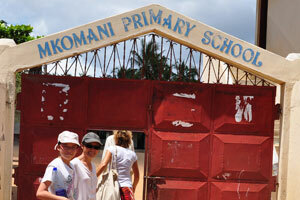 Mkomani Primary is a girl school with over a thousand students. 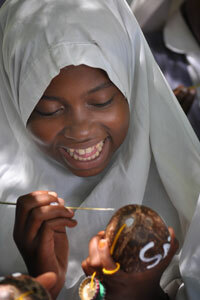 Mercy conducted the workshop to a bunch of highly motivated kids eager to paint their coconuts! 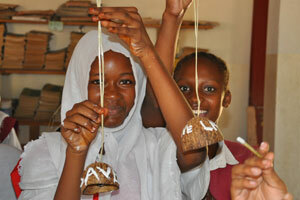 All the girls were proud of their coconut creations! 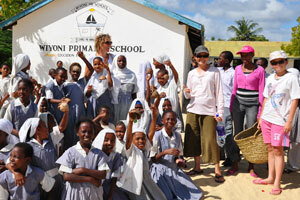 We got these kids to hands up for Save Lamu! 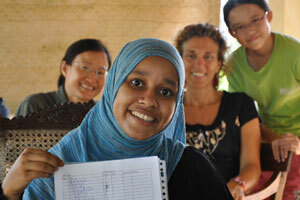 Yesterday, we completed our taste adjustment for our new Lamu Kaya and we also helped Nadia rehearse her presentation. 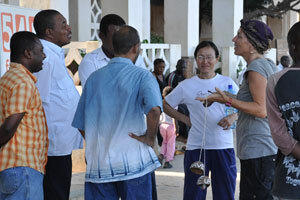 This morning, Monika and Nadia presented our Lamu Kaya to a group of British holidaymakers. Nadia secured her first batch of 15 orders. We were all so happy! 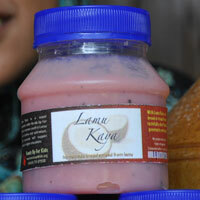 Meanwhile, the Lamu Kaya labels that I designed had been printed in Nairobi and were on their way to Lamu hand-carried by Moses, Monicah and Phanise, arriving this evening. 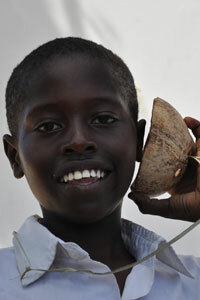 "I want to order Lamu Kaya." 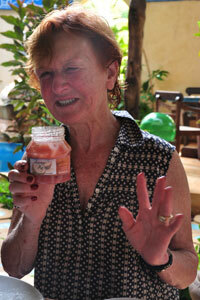 "Gimme 5 bottles of Lamu Kaya." "We too, give us one each." 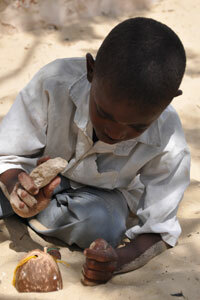 And so, Lamu Kaya was born. This social enterprise was created to help Nadia earn her way to pay for college education, to fulfill her dream to become a teacher. While it was an idea from Alvin, it was the decisiveness of Monika and the willingness of Nadia to undertake this experiment that led to its manifestation. We hope that this would be the start of many more social enterprises by Hands Up For Kids to empower children and youth in Lamu to stand up for their dreams. Stand up with good ideas but with feet firmly grounded, plan boldly and move swiftly into action. 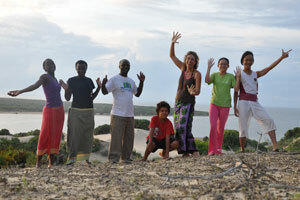 We suggested having Phanise and Monicah from CGH come over to help Monika to motivate the children in Lamu and teach them the African Child dance. Monika promptly agreed and we made it happened within days. 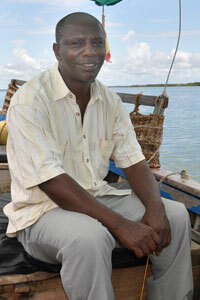 Moses accompanied the 2 girls in the long overland journey from Nairobi to Lamu. 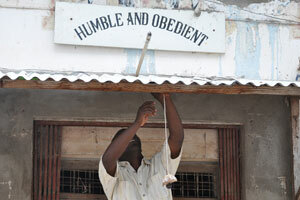 They took an overnight bus from nairobi to Mombasa, then changed to a 12 hour bus to Lamu. 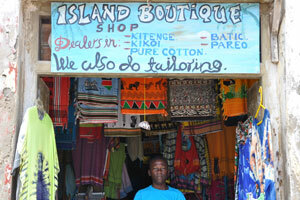 From the mainland, it was another 40 min boat ride to Shela. It was Monicah's first sight of the ocean, and Phanise's second. For all 3 of them, it was their first experience crossing the sea in a boat. 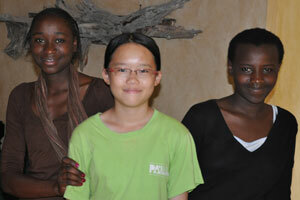 We hope that Phanise and Monicah would pick up swimming skill in their 2-week stay here with Monika. 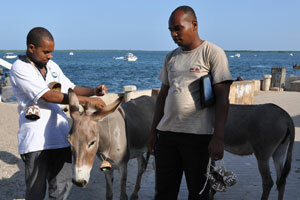 I took Moses to Lamu Town to look-see around and to distribute some donkey necklaces to restaurants, hardware shop and boutique shop. In the mean time, Phanise, Monicah and Robyn stayed back to help Nadia prepare kaya to fulfill her first batch of 15 orders, to be delivered tomorrow. 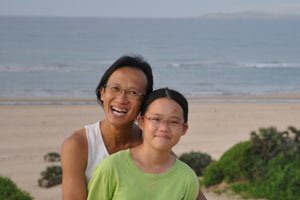 We left Banana House for the beach at 6am to catch sun rise. It was a wonderful morning at the beach. I enjoyed a long meditation session sitting in silence facing the horizon where the sky merged into the ocean. I also enjoyed a quiet moment staring at the vast sky with beautiful clouds that spoke to me in a cosmos language of love. The kids and Moses, especially, enjoyed a morning swim. 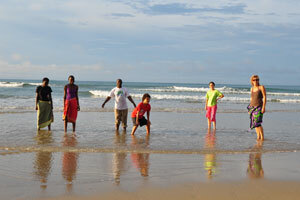 It was Moses', Phanise' and Monicah's first swim in the sea so it was especially memorable for everyone. Jin was unwell so she missed out on the fun. 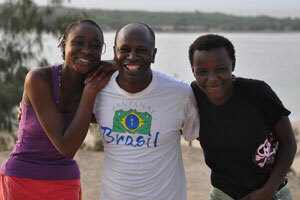 Daddy Moses with Phanise and Monicah. 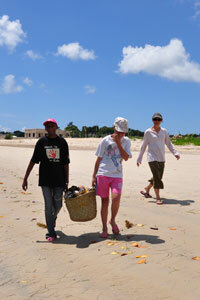 Alvin with Robyn at Lamu beach. 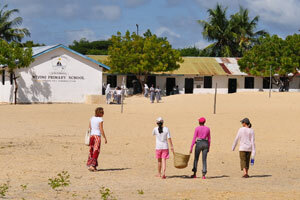 Lovely Lamu beach in the quiet of the morning. The kids had a splashing great time! 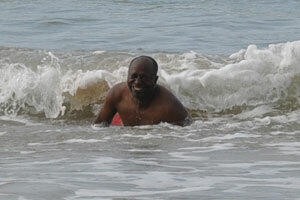 Moses' virgin swim in the sea! 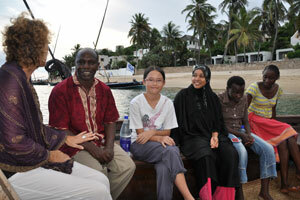 At dusk, Monika arranged for all of us to go on a sunset dhow. We sailed for only a short while as the windless sky couldn't bring us far enough to view any sunset. In any case, the heavily overcast sky was so pregnant with rain that it was a good idea to turn around. We got back to Banana House just in time to escape from a downpour. 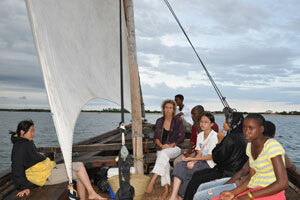 Well, at least we enjoyed a sailing experience in a dhow. 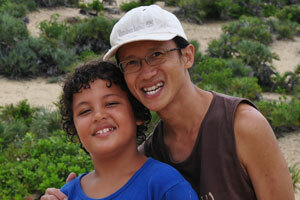 Best friends Karim and Alvin. We left a few days before Karim's birthday on 23 Nov.
Like all seva before this one, we are extremely privileged to be supporting a lady with a vision for a better world, through empowering children. 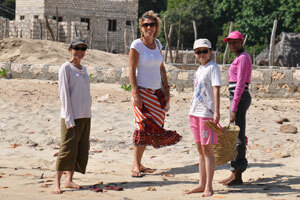 She may be Dutch but she has made Lamu her home and she is seeing sons and daughters into every Lamu child. We are honoured to have played a little role and we hope to continue supporting her Hands Up For Kids project.